(November 15, 2017) - Gene Elliott has been one of the most well-traveled and accomplished mid-amateur golfers in the game over the last two decades. He has made 29 USGA Championship appearances and has competed in the U.S. Junior, U.S. Amateur, U.S. Mid-Amateur, USGA Men's State Team, U.S. Four-Ball, U.S. Senior Amateur, and U.S. Senior Open. He also advanced to U.S. Open Sectional qualifying 14 times and was the stroke play medalist at the 1999 U.S. Amateur at Pebble Beach. His significant national victories include the 1998 Porter Cup, the 1998 Terra Cotta Invitational, the 2007 and 2009 Coleman Invitational, and the 2013 Crump Cup. In his native Iowa, Elliott is a Hall-of-Famer, having been inducted in 2012. He has won over 20 major Iowa Golf Association events, including three Iowa Amateurs, four Iowa Mid-Amateurs, and two Iowa Opens. He is a four-time IGA Player-of-the-Year (2002, 2011, 2015, 2016). Elliott won the Iowa high school state championship at Bettendorf in 1980 before playing college golf at the University of Iowa from 1981 to 1984. Upon graduation he turned pro and began to work with teaching professional David Leadbetter. In 1989, he earned his European Tour card. In 1994, he was reinstated as an amateur. Elliott turned 55 earlier this year and began his foray into competitive senior golf. In is first year as a senior, he has won the Canadian, Trans-Mississippi, and Crane Cup senior championships, was runner-up in the British Senior and George C. Thomas, and finished third in the Jones Cup and Crump Cup senior championships. He also competed in his 13th U.S. Mid-Amateur championship, making match play for the 12th time, and won the International Four-Ball with partner Mike McCoy. In Iowa, Elliott was the IGA Senior Player-of-the-Year, winning the Iowa Senior Amateur, the Iowa Senior Match Play, the Iowa Masters, and the Iowa Four-Ball, again with McCoy. He is currently the #2 ranked player in the AmateurGolf.com Senior Rankings, and should contend for the #1 ranking for many years into the future. Elliott served on the USGA Mid-Amateur Committee for seven years (1999-2006) and has been a member of the Iowa Golf Association Board of Directors since 2004. Away from golf, he owns and operates Elliott Equipment Company, one of the leading companies in the municipal and solid waste equipment market in the United States. Most interesting or unusual tee gift you've received: At the 2016 U.S. Mid-Amateur at Stonewall Links (a former dairy farm), we all got a large tin milk jug with the logo on it. I drive it straight with average length, and am a great iron and wedge player. My putting has gotten good. Paul Azinger has said that there are two types of competitors—the “Chip-on-your-Shoulder guy” and the “Love-of-the-Game guy”—and they are both hard to beat. Which one are you? A “Chip-on-your-Shoulder guy”. You're only as good as your last shot. Shot after shot, round after round, tournament after tournament, you are always grinding and, I feel, proving you can compete! What is your secret to success as a competitive amateur golfer in balancing work, golf and life? It's very hard! I plan my schedule as far out as possible. When it's time to compete, compete hard. And when it's time to work, work hard. Have you ever gotten burned out, and if so, how did you rekindle your enthusiasm? Yes. I get away and don't touch a club for a couple of weeks. Will you put the clubs away this winter and if so, for how long? I regularly take time off and I like my time off. I enjoy playing competitively but, I also like not playing and time away from the game. What is the most unusual thing you've seen in your years of competing? 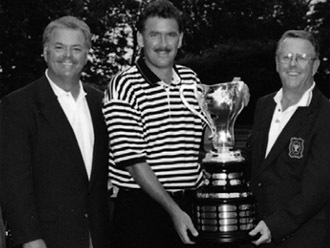 The Porter Cup in 1998, which I was fortunate to win, was broadcast on television. What was your greatest disappointment, when you fell short of your hopes or expectations? The 2017 U.S. Senior Amateur. Tough loss! Editor's note: Elliott entered his first U.S. Senior Amateur as one of the favorites, and easily advanced through stroke play qualifying as the 18th seed. After shooting 69 in the second qualifying round, he beat former champion Patrick Tallent 6&4 in the first round of match play, shooting the equivalent of 4 under par. In his second round match against Keith Decker, Elliott was again 4 under par, putting him 3 up with 5 holes to play. But a bogey on 14, an improbable chip in by Decker on the 15th--"one that goes in maybe one out of 100 times" he said--and a double on 16 put the match all square, and when Elliott bogeyed the 18th his tournament was over. Fueled by the disappointment, Elliott immediately headed back to Iowa, entered the Iowa Senior Amateur which was starting the next day, and won the tournament. How has competitive amateur golf changed since when you started competing? There used to be 35 mid-amateurs in the field at tournaments like the Porter Cup, the Sunnehanna, the Northeast Amateur, and the Western Amateur. Now there are less than 10, and they are the younger ones, under the age of 30. Editor's Note: To underscore his point, in 2017 there were 10 mid-amateurs in the Porter Cup field, 5 in the Sunnehanna, 9 in the Northeast, and 7 in the Western. Five of the top six players in the AmateurGolf.com Mid-Amateur Rankings are aged 30 and under, as is the current U.S. Mid-Amateur champion. What is one thing you would change about amateur golf? Not specific to amateur golf, but I would change the ball (to roll back distance) so that the great golf courses stay relevant. Two of the best mid-amateur/senior golfers over the last 2-3 decades are from West Des Moines, Iowa. How does that happen and how would you describe the friendly/competitive dynamic between you and Mike McCoy? I could write a book on this question! Mike McCoy is what a true mid-am golfer is all about. He's known all over the world and rightly so. He set the bar for the mid-am golfer. Everyone who knows Mike knows he is a very mild, soft-spoken man. But on the course, he is all business and a fierce competitor! Mike is my best friend and we have battled each other for decades. We've had a lot of highs and lows together on and off the golf course. I think we feed off of each other's success which makes us both better.